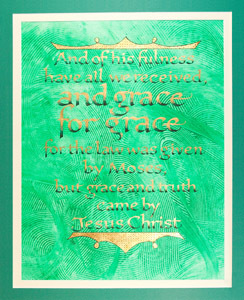 Six of Don's calligraphic pieces are installed in the flanking corridors of the new sanctuary building of Friendship Baptist Church, 5510 Falls of the Neuse Road in Raleigh. He developed the concept for these pieces while in his Cotton Company Studio in Wake Forest and completed the basic designs at that time. But, not being able to define an end use for them, he set them aside to go on to other, more pressing things. When the new sanctuary was completed and Don surveyed all the huge blank white wall spaces, he immediately knew the intended purpose of that then three-year-old project. The works (see below) are all 18"x22", three of them vertical and three horizontal, and each has as a background one of the colors of the rainbow, executed in a paste-paper technique. 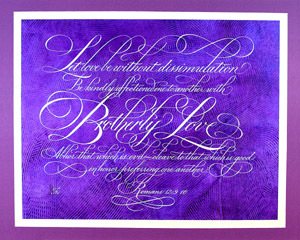 Each Bible verse was chosen to be compatible with its color (e.g. 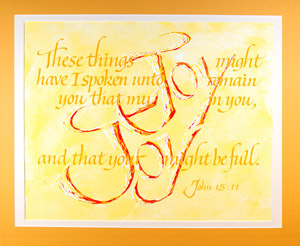 the red piece speaks of God's power, the yellow of joy, etc. 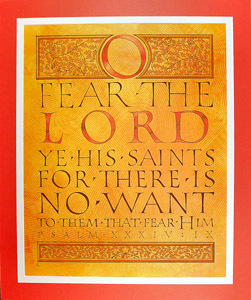 ), and a different calligraphic hand, specifically chosen to serve the words (qv) is used for each text. 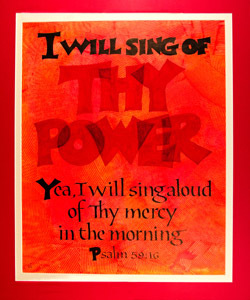 Various media were used in the creations, including acrylics, gouache, watercolors, inks and wheat starch paste. 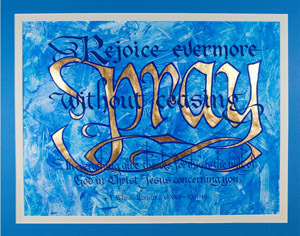 The substrates are all D'Arches Text Wove 100% rag mouldmade paper. The church is only open during hours of regular services: Sunday morning and evening and Wednesday evening. If you would like to view them at other times, just call Don and make an appointment to visit the church.